University is a fantastic time to explore the world and gain new insights about yourself and others. International volunteering provides the perfect platform to do just this, and to gain unrivalled skills and experiences to help further your own personal development and career opportunities. As well as the adventure, friendships and impact you can have, international volunteering offers endless benefits to both those participating as well as the host communities. No-one who travels ever regrets it, but nevertheless, it can often be hard to quantify different opportunities and it can be hard to commit to where you’ll invest your time and efforts during your time at university. We thought we’d highlight just a few ways international volunteering can benefit university students and help illustrate why you may decide to pursue some international volunteering during or after university. The summer break is long and doesn’t have to mean getting a job in a bar or café just to makes ends meet. So, for the adventurers and explorers, the doers and the go-getters, I present to you, 10 crystal clear benefits volunteering abroad offers. We could have listed 100’s of benefits, but we know you’ve got lots of studying to do, so we thought we’d keep it short and sweet! 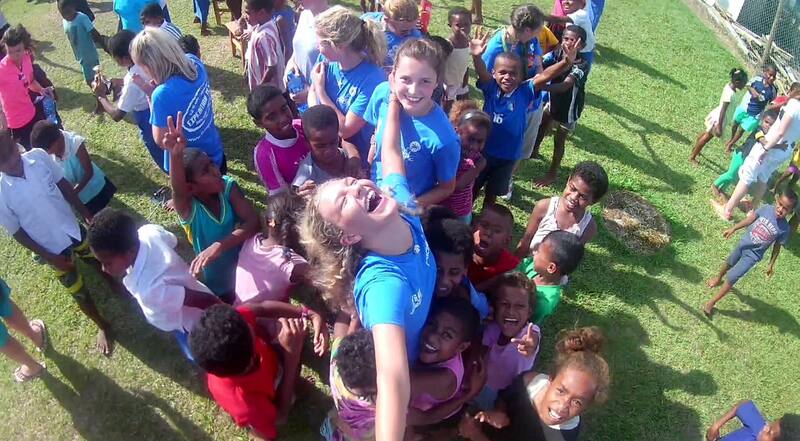 (And if you need any more persuading, check out the video below from some recent volunteers sharing their experiences in Fiji with us 👇). New Perspective – It allows you to see a host country through the eyes of local people and understand what life is truly like in remote communities around the world. Avoid the tourist traps and discover what a country is really like. Impact – Think Pacific recently won GoOverseas’ award for volunteering organisation that has the biggest impact. This really means the world to us, as we wholeheartedly believe that volunteering can be the vehicle that leads to change in vulnerable communities. Our volunteers can see the direct impact they have which is both incredibly rewarding and incredibly effective at supporting remote Fijian communities. Communication – Communicating in a foreign language within new cultures, on the other side of the world, can be challenging. But this creates a wealth of skills around communication that help you communicate with people from all walks of life. This is incredibly useful for any career (as well as for everyday life). New Friendships – We strongly believe in the benefits of volunteering as part of a team here at Think Pacific. This allows you to forge unbreakable friendships that’ll last a lifetime. Once you’ve spent a month or 2 on a remote island with these fellow volunteers, they’ll know you as well as you know yourself! You’ll share unique experiences and moments together and always be able to reminisce with each other about the adventures you embarked on. Experiences – International volunteering provides you with endless unique experiences. Every day is an adventure on project here at Think Pacific. Our volunteers all come home with incredible experiences from all aspects of project. From teaching in the schools, to general village life, to traditional customs, international volunteering offers it all. Confidence – Volunteering abroad will put you into situations and environments that are new and unknown. This forces you to constantly live outside your comfort zone. In doing so, you’ll soon find things that used to be hard become so much easier due to your new ability to adapt to your surroundings. Gaining confidence is a fantastic benefit for both personal development and career opportunities. Global Citizen – International travel of any sort is beneficial to help expose you to new cultures, countries and ways of thinking. Understanding how and why people live the way they do around the world, can help all of us become much more conscious of how we can work together to create a world in which everyone feels happy and safe. Real World Achievements – Volunteering on a Think Pacific programme doesn’t mean participating in arbitrary projects – far from it! Instead, we work alongside the Fijian government and Ministry of Health, and Ministry of Education, as well as other charities, identifying potential challenges and issues, and carefully designing volunteering projects that achieve specific goals and targets. This means every volunteer knows the difference they have made. Sharing Skills and Knowledge – From supporting children in schools, to organising sports coaching, there are plenty of opportunities to share your own skills and knowledge with others. This is a fantastic way to impart wisdom relating to your favourite hobbies and interests. Who knows, you may just be the missing piece a student needs to finally understand that maths topic, or perhaps, your rugby coaching could inspire a child to pursue it further. Cost Effective – Surprisingly, volunteering abroad can actually be quite a cost-effective way to spend a summer. A holiday with friends around Europe can soon add up, as too can just staying at home. When working out how much it is per day volunteering abroad, you may be pleasantly surprised how cheap it is compared to other options you might plan on doing. This list barely scratches the surface, but you can already see some pretty monumental benefits of international volunteering while at university. Check out the new video below, illustrating what a day in the life of a volunteer looks like on a Think Pacific project. If you’d like to learn more about our expeditions to Fiji, simply get in touch with our friendly team who will be more than happy to help.